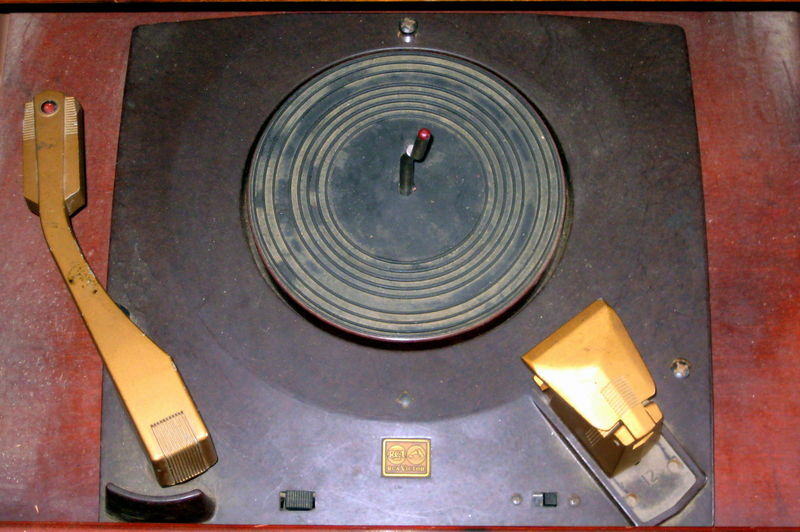 When RCA Victor released its new 45 rpm record format in early 1949, there had to, of course, also be equipment in the hands of consumers that was compatible with the new system. 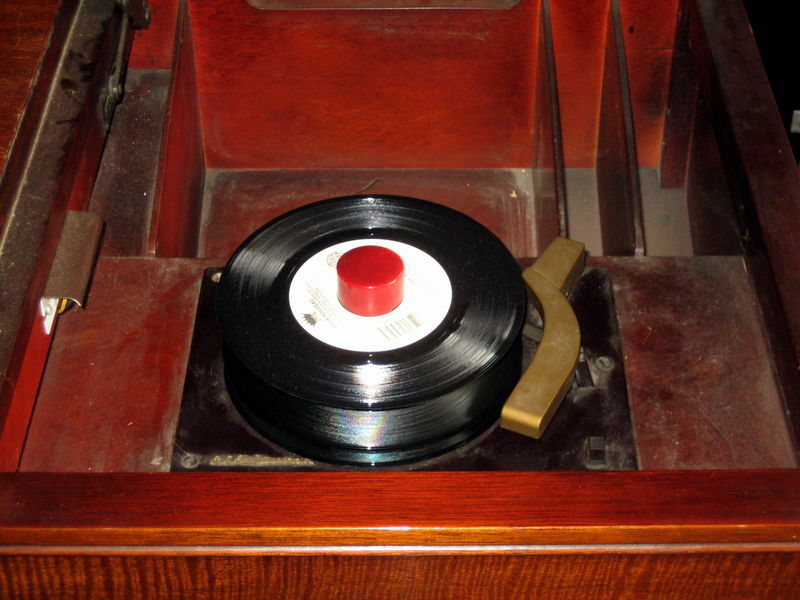 Believe it or not, this monster was among the very first offerings designed to spark demand for 45s. 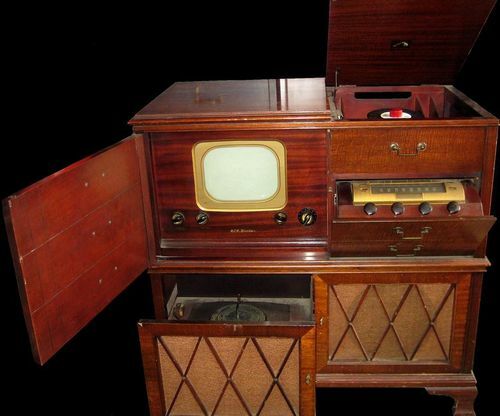 Aside from lacking an audio output stage, this set uses the exact same TV chassis as the 8-T-241. Both of the remarkably clean chassis had all of their original RCA Victor-branded tubes when restoration began. They no longer do, more than a half dozen of the originals testing weak or shorted. While the TV chassis isn't cramped, its layout did not readily allow for my usual practice of mounting replacement electrolytic capacitors underneath on terminal strips. Borrowing an idea from another restorer, I removed the old can electrolytics and mounted the new caps on small sections of perf board in their place. 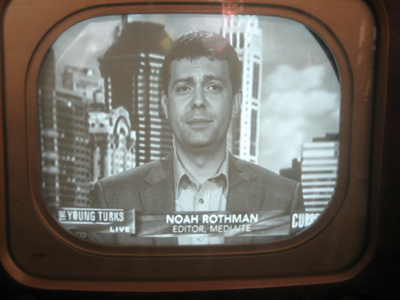 When first powered up after replacement of all of the electrolytic plus a few of the paper capacitors, I was greeted with a sharp image on the screen, but there was something causing the brightness to flicker and almost no audio at all. After a few minutes the image began to shrink and dim, a 1KV paper capacitor having given up the ghost with much sizzling and bubbling. I waited until the replacement cap arrived from Just Radios before powering up again, doing the tube testing and replacement in the meantime. One of those replaced tubes was to cause much anguish--and postponement. With the rest of the paper caps replaced the set worked very well, but whereas there seemed to be faint audio at first, there was now nothing but buzz. This was the first split-sound set I had ever done and made the mistake of trying to tune by ear the same way I had previously done intercarrier sets. Compounding this mistake was the fact that there seemed to be a hint audio one channel below the video, that is, with the RF modulator on channel 3 there was discernable sound on channel 2. Soon enough by twisting the discriminator and sound IF slugs I had beautiful loud, clear audio coming in 6 Megahertz below where it belonged. Time to get some experience with alignment procedures. Up until this point I had been more than happy to heed the advice not to attempt an alignment unless one was necessary. Clearly this was a case of urgent necessity. Fortunately I had a friend to help. Known to all as blue lateral, he generously donated a frequency counter, without which I couldn't possibly have put my old Eico signal generator to good use. With bl's guidance (and his counter to keep tabs on the Eico's drift as illustrated at right) I was able to successfully complete the first steps of the alignment procedure as outlined in Sam's (those which deal with sound IF). Unfortunately there was still no hint of audio, at least where it belonged. blue lateral did some quick frequency calculations and determined the oscillator had to be running low and suggested replacing the 6J6. Since I had already replaced the original 6J6 I was reluctant to bother doing this, but when I did voila, sound! The level is considerably reduced, but at least it's where it belongs so I'll live with it. The radio chassis is very cramped. 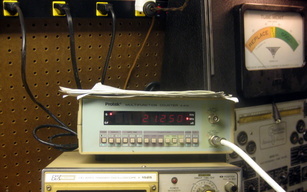 The 6X5 rectifier has a notorious reputation for shorting heater-to-cathode and taking out the power transformer in radios that run it close to its design limits. At ten tubes total and with a push-pull output stage, this radio probably qualifies as at-risk, so I fused the plate leads with #47 lamps. In case of a short, they will burn out immediately, saving the transformer. So many square feet of cabinet, so few square inches of screen. The four stages of IF and DC-coupled video assure a very detailed and faithfully reproduced picture but you can't fully appreciate it unless you sit close. Very close. 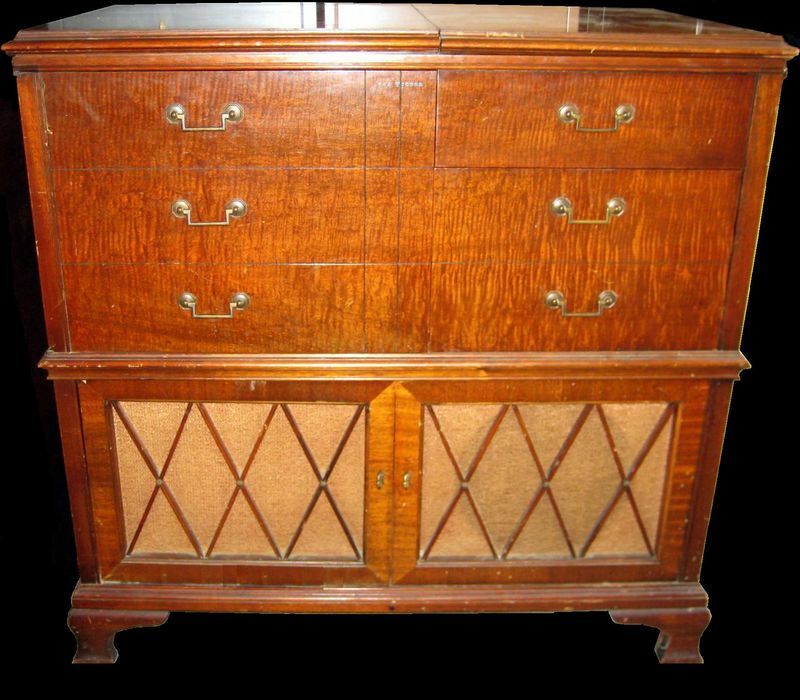 With the TV back in action and good radio reception (surprisingly so for the FM side) I'm calling it done for now, but hope to be able to also get the turntables refurbished in the not too distant future. The multi-colored vinyl 45s of the day were played and stored up here under the lid. RCA would eventually be forced to adopt the new LP records or risk losing artists from its Red Seal line. Of course you didn't have to replace all your old records with 45s...not right away anyway. You could still enjoy them on the very same instrument as long as you didn't mind stooping a little. 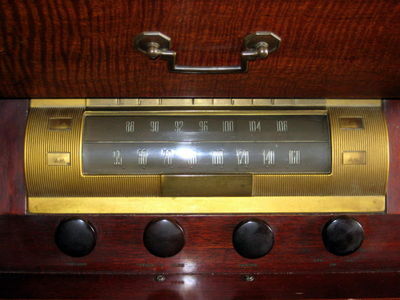 FM radio was also new but, unlike the 45, it wasn't an RCA invention. Because of his contempt for what he considered a rival format, RCA head David Sarnoff saw to it that FM performance would be inferior to AM on RCA radios that tuned both bands. 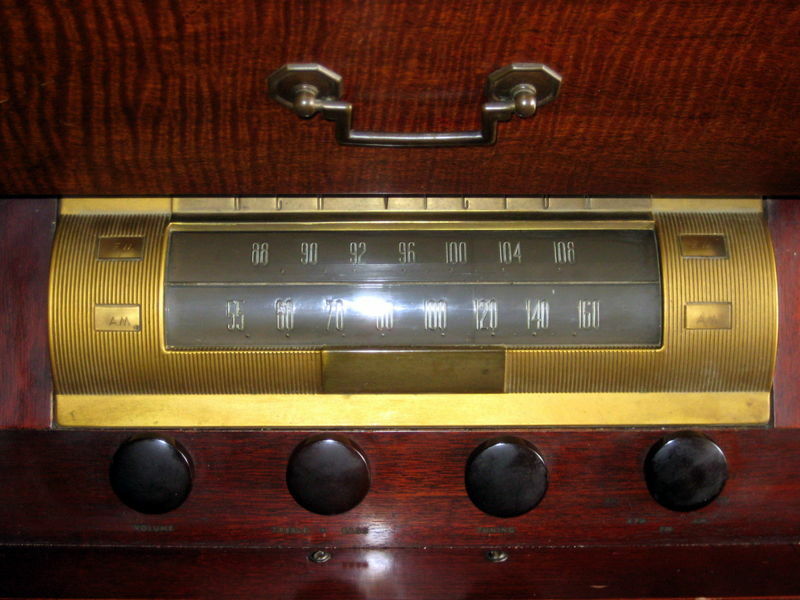 In fact, RCA AM/FM radios of the time are among the worst FM receivers ever made.